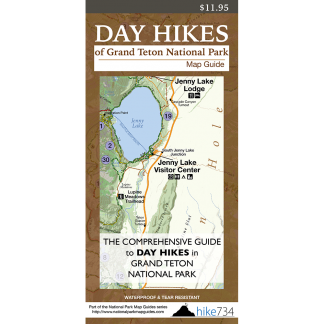 This hike visits Christian Pond before looping around the lesser-visited Emma Matilda Lake, a larger, kidney-bean shaped lake tucked between two forested ridges. The trail starts near the corrals at the Jackson Lake Lodge and heads to the top of the moraine that overlooks Christian Pond (see Christian Pond Overlook for description). From here, continue up into the forest where another trail junction is reached. The trail to the left is the shortest route to Emma Matilda Lake and Lookout Rock. Take a right, however, for the more scenic route to Lookout Rock and the lake. This stretch takes you along a ridge overlooking the Oxbow Bend area of the Snake River. 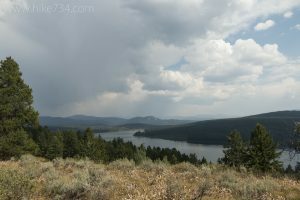 This vantage also provides views of Signal Mountain to the south and Jackson Lake and the Tetons to the west. At the next junction stay left instead of dropping down (the trail down disappears). You cross a sagebrush meadow, then down through some trees, and join the aforementioned trail from Christian Pond. Head right to Lookout Rock which is a fantastic viewpoint of the western section of the lake. From here, the trail roughly follows the shoreline with filtered views of the lake through the trees. The trail leaves the lake and climbs up the cool, forested ridge. As you descend, you pass through a section where a strong wind gust blew down a large swath of trees giving you a glimpse of the lake. Cross the outlet of the lake to reach the junction with a trail that heads to Pacific Creek Road and serves as an alternative trailhead. Stay left at this junction as you begin to head north through a mixed forest of aspen, fir, and pine. As you climb, intermittent meadows give you views of the lake. At this junction, stay left where the trail passes through more meadows that are popular with Sandhill Cranes. Instead of following the north shoreline, the trail climbs up a forested ridge. It breaks out into an old burn area offering some nice, but slightly obstructed views down onto the lake. Continuing on, you get views of the western end of the lake, part of Jackson Lake, and partial views of the Tetons. The trail drops steeply down through trees and out to the marshy meadows near Christian Pond. Continue straight at the junction through a wetlands area with willows, and climb up on the moraine where you pass through sagebrush meadows. This area gives you a view overlooking the meadows and a few pocket ponds, including Christian Pond in the distance. The trail parallels the highway, with views of the Tetons, as you make your way back to the starting junction to complete the loop. Trailhead: Take the road to Jackson Lake Lodge and make a left at the first junction, then another left to the gas station. Park in the parking lot on the right near the corrals, and find the trailhead at the east end. For the alternative trailhead, turn north onto Pacific Creek Road from Hwy 287 approximately 1.2mi/1.9km north of Moran Junction. Drive for approximately 1.5mi/2.4km to an unsigned pullout on the north side of the road. An obvious, unsigned trail takes off from the pullout.